Hi there everyone! I hope all of you had a wonderful holiday. We had a quiet holiday, just the four of us, which... considering this stupid cold we all seem to have to varying degrees, was probably a good thing. The boys had fun though, and it was a great day. Today is blog catch up day for me. I didn't mean to be gone all week, but with the kids home it's been hard to find the time to sit on the computer. My days have been filled with light-saber duels, snakes and ladders marathons, puzzle building, and lots of hugs and snuggles. I really couldn't say no to that! Don't worry though, while I may not have had time to sit down an whip out a few posts, I did finish up the last of the printables for the personal planner. (Hence the title of this post) There's a number of them coming up at you, so I'll stop babbling and start sharing. The first one I'm sharing is a request. 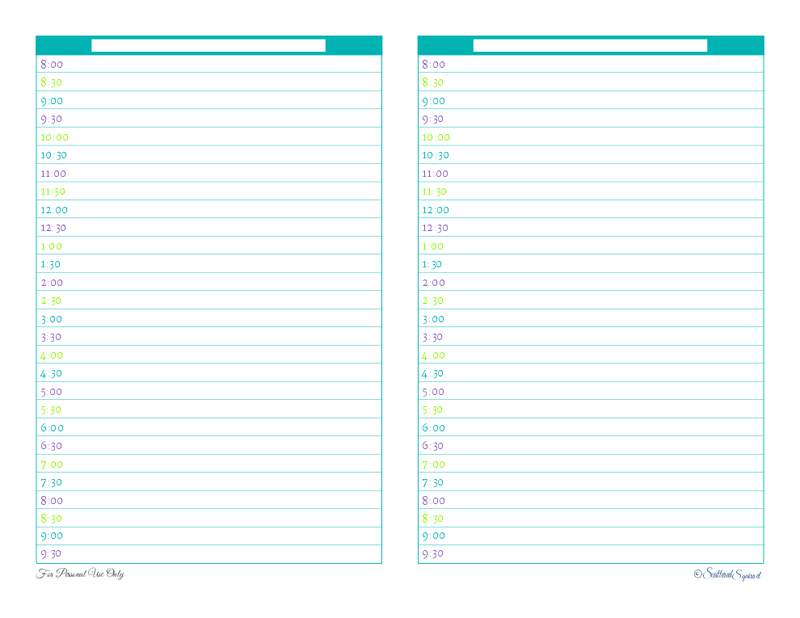 I received a few emails asking if I was going to do the daily planner in a half page, and here it is! This one is followed by my yearly planner. I don't, as a rule, make resolutions. I do, however, make goals, and the new year is a great time for setting goals for the coming year. 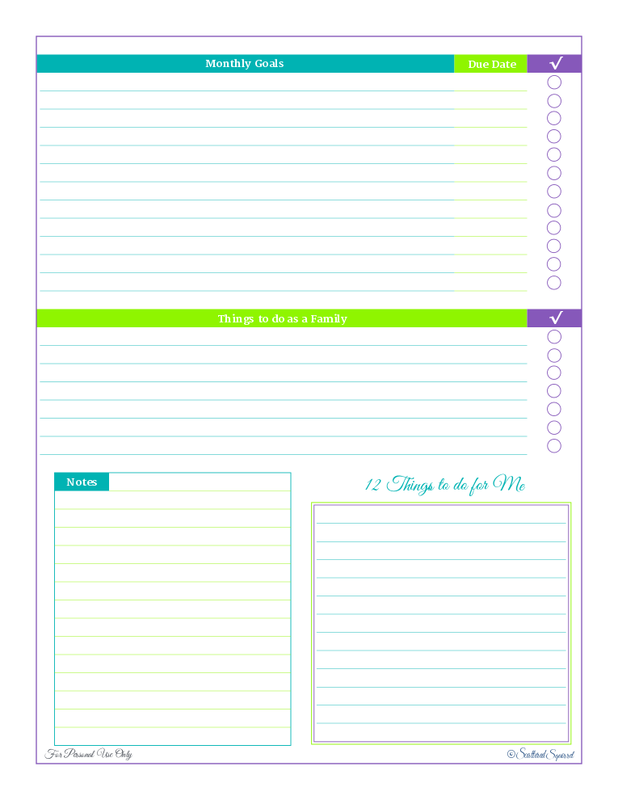 This page is more for small, personal goals, like establishing a new routine, learning something new ... you get the idea. I've also included some space for things we want to do as a family. These could be anything from a vacation destination to a simple outing. And, because I have a hard time taking time out for myself, I decided that this year, I would think of 12 things I could do to sort of nurture my soul. To recharge my batteries. I figure I can handle once a month. It probably should be more often, but for now this where I'm starting. These will most likely be little things like, "take time to let nails full dry after painting" or "spend a couple of hours at the library... alone!" And that concludes the planned printables for the personal planner. I hope you find some of the useful in the coming year. It also means it's just about time to wrap up this post. I'm getting kind of misty eyed here, because this is my second to last post of the year, and it also happens to be my last post here on Blogger. Yeap, that's right! The switch to Wordpress is happening tomorrow! Crazy, yep! Scary, you betcha! But I've been testing the new site, playing around with some of the features, and I'm happy to report all seems to be working well, and I think it's time to stop stalling and take that next leap. To my friends on Google Friend Connect, I do so hope you'll come over and say hi at scatteredsquirrel.com, or follow along another way. We've got the Facebook page, the Google + page, Twitter, email, and RSS, and none of those are changing. All of you wonderful readers have made this blog such a wonder to be a part of! Thank you for coming back each day, week, month.... whenever you get here. And if you're new here, thank you for stopping by! I hope we'll see you around some more! You all mean so much to me. Please enjoy this final, unplanned printable (or should I say printables, cause technically there are 12?) of the year! Good morning everyone, happy last weekend before Christmas. Are you all set for the big day? We are going to be brave souls and venture out for one more shopping forray today .... hopefully I retain my sanity throughout. I'm sorry yesterday's post didn't go up as planned. I was at the school with Liam for his Christmas party. It was a lot of fun, the kids spent the morning doing crafts, having some fabulous snacks and then the kids performed some Christmas carols. We missed the carols, as Liam was nibbling on the goodies for snack time he told me he was feeling kind of tired, and asked to go home. Poor guy! He made the right call though, because we got home and he spent most of the afternoon laying down. At least he was able to see his friends and his teacher and wish them a Merry Christmas, and he was able to take part in some of the holiday fun. This cold is not a nice one, I'm hoping it goes away soon. So, between craft morning and still sick Liam (and a still kind of sick me) I just didn't make it onto the computer yesterday, and I'm very sorry about that. Busy days tend to make my head spin. I find that on those days I need to pay extra attention to how I'm using my time. Most often, those days find me reaching for a blank sheet of paper, where I proceed to fill it with lists, sectioned off by category, and a plan for the day. Last week, as I was doing my usual scribble, it dawned on me that maybe having a daily planner page in my personal planner would be a good thing. I know I won't use the daily one every day, but having it for those days I do need it would be a huge help. And so, my daily planner page was born. This is sort of a window into my brain. I use this one two different ways. On days when I'm feeling particularly scattered; when I know I'm going to have to dig deep to find any kind of productivity, I use the category boxes to list the items that MUST be done that day. Then I schedule them into the day planner on the left side. I use the to do list for any items that I feel need to be done, but don't quite meet the MUST stage qualifications. On days when I'm not feeling quite so scattered, I use the boxes to keep track of things that I want to do over and above the normal. Perhaps it's something like "plan a family game night for later in the week" or maybe it's something I noticed around the house like "clean vent in half bath". I guess you could say that on these days, I use the boxes as a sort of secondary planner. 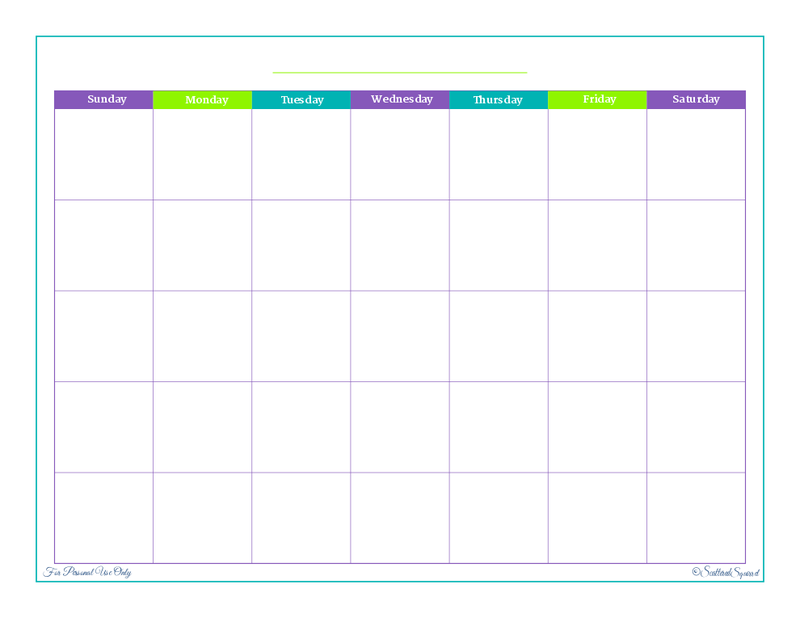 Now, I know that not everyone wants so much on a daily planner page, so I thought I would make a simpler one for those of you who just want a simple day planner. This one is kind of a two in one. 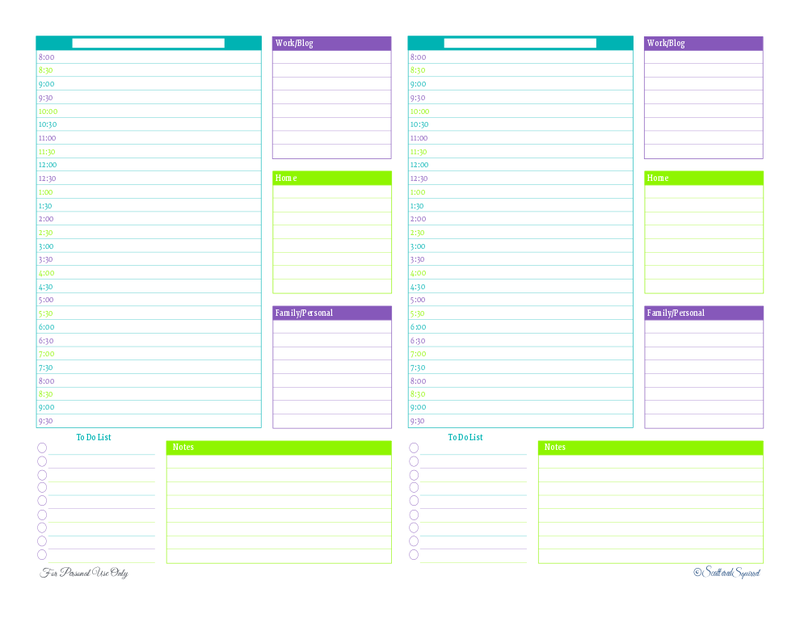 You would use it as it is, two days on one page, or you can use for a half sized planner for in a mini binder. With the half page planner in mind, I took care to possition the two days so that you had two ways of putting it together. You can print doubled sided and using a paper cutter, cut the pages down the middle. (straight down the middle) Or, if printing double sided isn't an option, you can simply fold the page in half. Hole punch and you're ready to go. As always, to grab your copy click the captions. And that pretty much concludes the planner part of the personal planner. I have a few more printables to share next week. 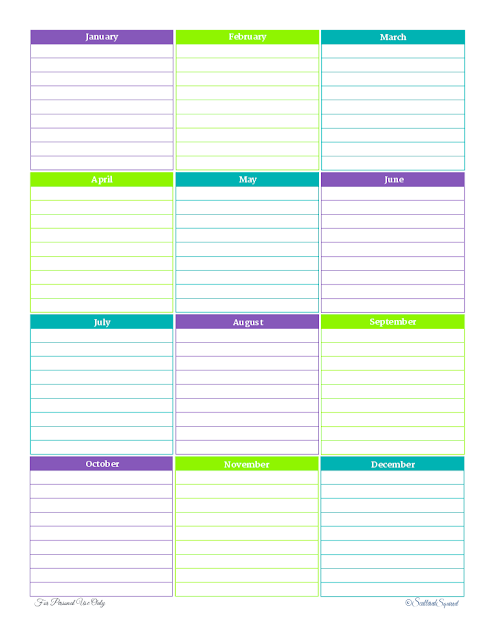 Because of all the holidays this coming week, and the switch over to Wordpress (I'll announce the exact date on Monday) I'll be sharing the rest of the planner printables later in the week next week, and I'll share the post of how I put it all together first thing in the new year. 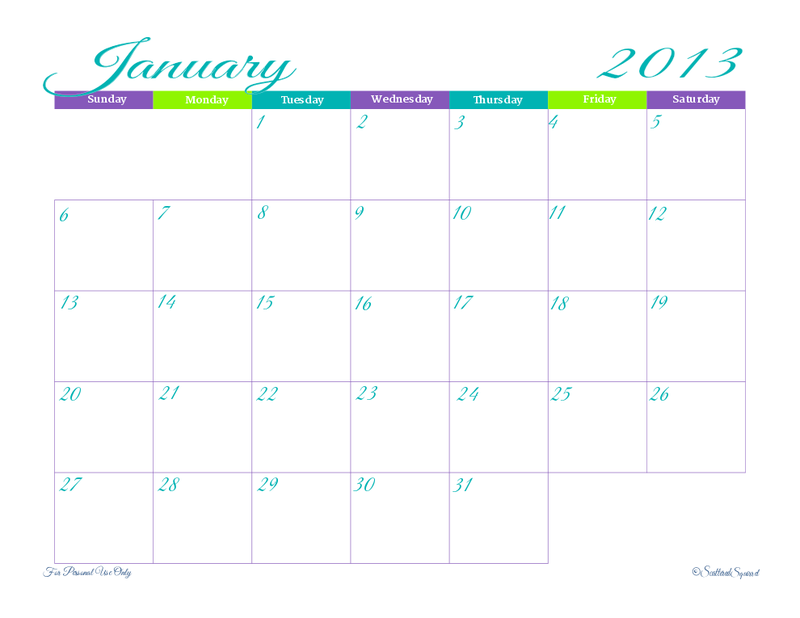 Can you believe how fast the month is going by? Are you all ready for Christmas? Are you ready to say good bye to 2012? Hi everyone, I hope that this finds you all well and happy. Last month I started a new feature, Reader Request. Where you, my lovely readers, could write in and let me know what kind of printable you wanted. 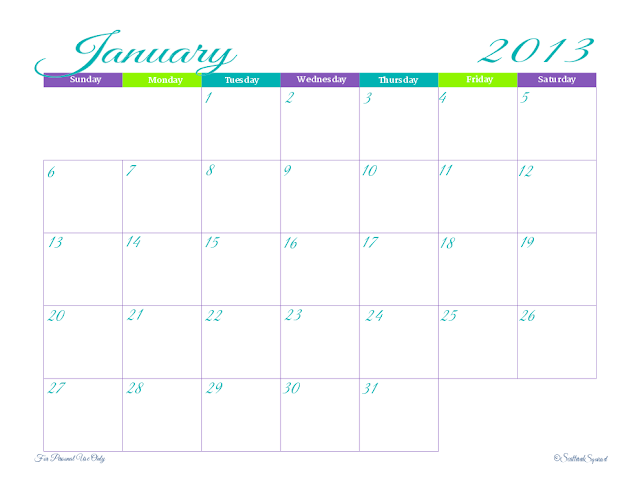 Once a month, or more often if I get enough requests, I'll make a printable that one of you has asked for, and share it here on the blog. Last month, I made up a Room by Room cleaning checklist. It's been a huge hit. This month, I've got something a little different up my sleeve. This month's request came to me from a friend's niece She started high school this year, and is feeling a little overwhelmed with some of the larger school projects being assigned for homework. Because she is involved in a number of after school activities she is really trying to plan out her study time so she's able to stay on top of school work, as well as continue to meet her other commitments. Currently, she uses her school issued planner to try to keep track of everything, but that means flipping back and forth between the weeks, and for her it just wasn't working. She told me she was looking for something that would allow her to keep track of the important info for each assignment, as well as a place to break it down into smaller chunks. This teen is pretty big on goal setting, one of the MUST haves for her, was a space to allow her to set her own deadlines for each step. How could I possibly say no? I kept it pretty simple. There's space for what class, what teacher, date assigned, date due, and how many marks it's worth. Having the assigned date was really important to my friend's niece. It allows her to see, at a glance, how long she has to complete it, as well as being able to see how long has already passed. There's a box for keeping track of criteria, this is for any notes on teacher expectations. 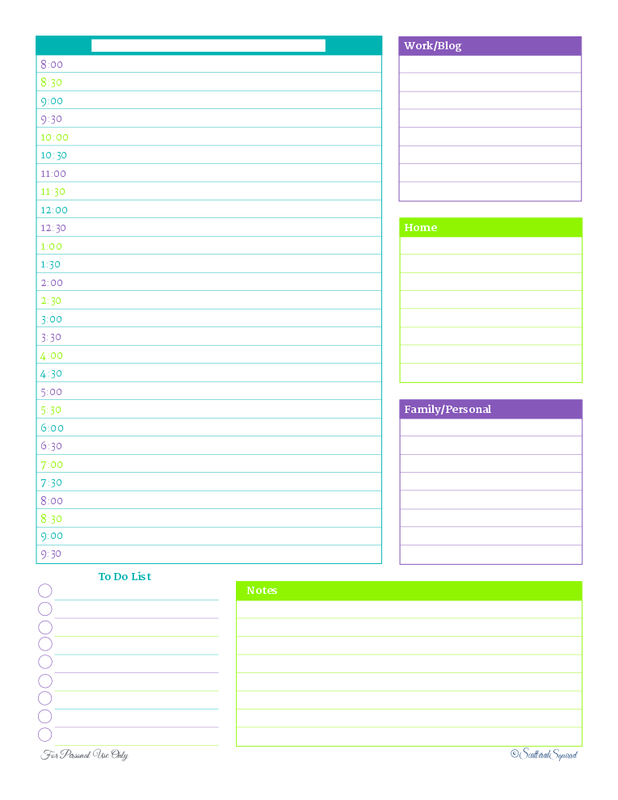 The idea is that this sheet will hold all the important info and can be kept at home. And the last section is a simple checklist area for breaking a project down into smaller, more manageable chunks. This section will enable a student to schedule these tasks so that large projects are not so overwhelming. 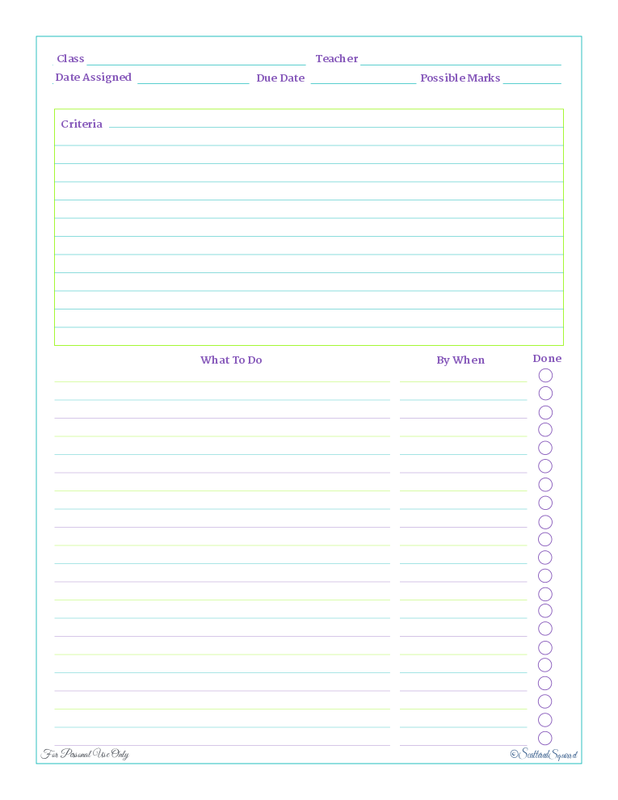 And I'm still taking requests for more printables, the more the merrier! If you've been looking for just the right thing, or heck, maybe you don't want to spend hours scouring the web looking for the right thing, just drop me a line and I'll see what I can do! Can you believe there are only five more days til Christmas? Do you ever feel like Christmas starts off taking forever to get here and then all of a sudden, BAM! it's so close you wonder where the time went? Are you all ready for the holiday? Got a Busy Week? There's a Printable for That!